Multiple servings of turkey, first roasted then reintroduced as turkey stew, spiral ham, beef stew, a cheeseburger and countless sticks of pork barbecue–all consumed since Thursday. I happily yielded to this glutton fest disguised as Thanksgiving but I think the party should have ended a few days ago. This normally enthusiastic carnivore has had enough meat for a while…or at least for the next couple of days. What came together tonight was a product of two recipes that I combined to make a satisfying meal–and a 180 degree turn from the meat fest I’ve indulged in. In Alice Waters’ Chez Panisse Vegetables I found a different way of serving brussels sprouts: It involved separating the individual leaves before cooking them. As tedious as the task sounded, I was curious about cooking brussels sprouts this way. I didn’t expect dramatic results but I’ve had pleasant experiences using broccoli rabe and radicchio in pasta, both possessing a mildly bitter quality like the sprout, so I thought, why not? 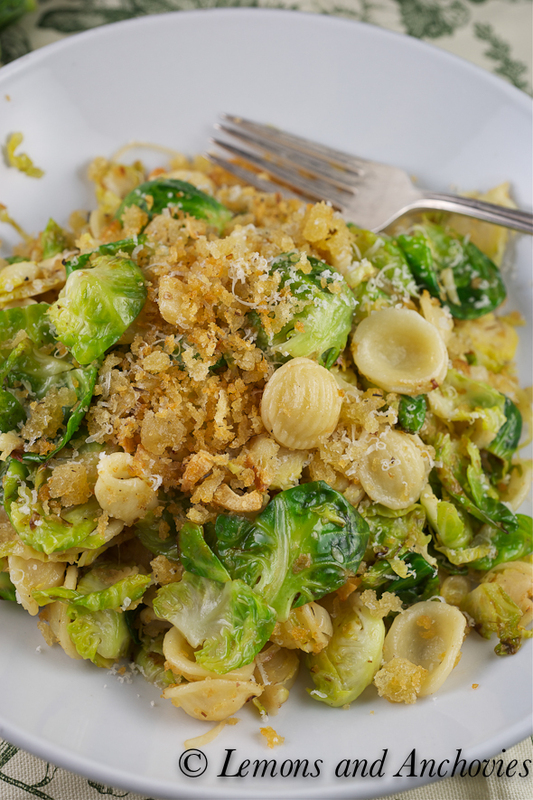 Then I also remembered that I’ve been meaning to try a bucatini and bread crumb dish from Lidia Bastianich–the bread crumbs and brussels sprouts sounded like a good match to me. Separating the leaves of the brussels sprouts turned out not to be such a big chore. I removed the core of each sprout with a small knife, separated all the leaves I could and sliced thinly the remainder. Sautéed in garlic and olive oil and tossed with the chewy orecchiete (“little ears”) the brussels sprouts were more delicate, sweeter. The bread crumbs, which I toasted with sliced garlic and dried oregano provided a crispy contrast (and I think are a must in this dish) while some grated Parmigiano-Reggiano gave the overall dish just the right amount of saltiness it needed. The key to this dish is in the proportions. The book did not specify amounts in the recipe so I started with a little over a pound of brussels sprouts, a heaping cup of bread crumbs and a pound of pasta. As it turned out, I only used about half of the latter. You’re familiar with the adage “there’s strength in numbers.” With the leaves separated, the brussels sprouts lost what some might consider their offensive bite. They became little petals of veggie goodness. 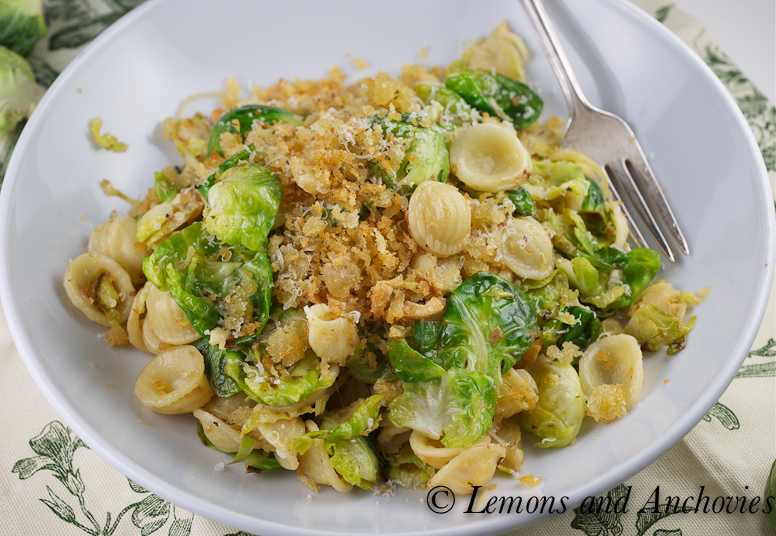 Consequently, adding a pound of dense orecchiette would have overpowered the sprouts and resulted in a bland dish. This amount still yielded two generous portions. Tip: For a bolder flavor, I would consider adding some chopped anchovies to the olive oil before sautéing the sprouts. Next time. 1. Bring a pot of water to a boil. Salt the water before boiling the orecchiette. 2. To toast the breadcrumbs, Heat at least a 1/4 cup of olive oil over medium-high heat. Add about 5 cloves sliced garlic and cook until they’re pale and just slightly colored. Add the bread crumbs and make sure they’re tossed well in the olive oil. Watch your heat and turn down to medium if you have to. Stir frequently, making sure that the garlic doesn’t turn too brown. When the bread crumbs start to get a little color, add the dried oregano and cook until the bread crumbs and garlic are uniformly toasted and brown. Transfer to a bowl and set aside. 3. 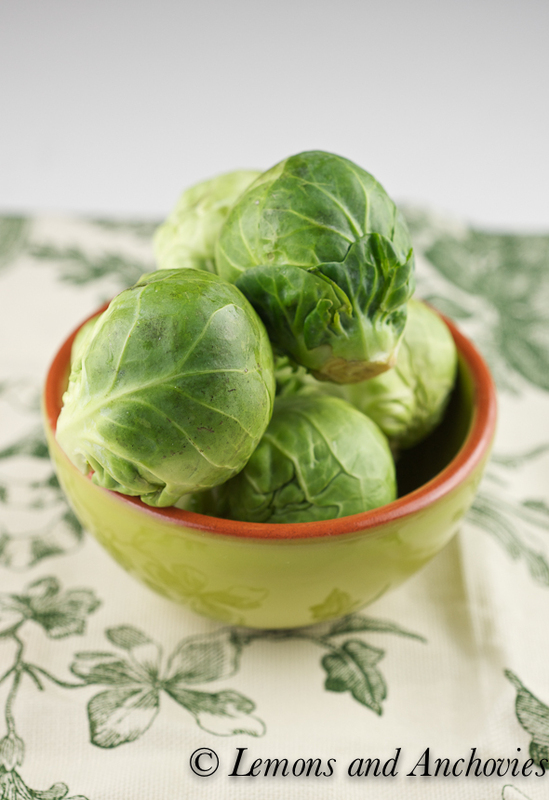 To prepare the brussels sprouts, separate the leaves by using a small paring knife to cut out the core of each sprout. Most of the leaves should pull apart easily. As you reach center of the sprout, the leaves will become more difficult to separate. At this point, I sliced the sprout thinly and added to the leaves. 4. Heat a few tablespoons of oil in the same sauté pan. Add the sprout leaves and toss for a minute or two or until some of the leaves start to get brown. Sweep the sprouts to the outer edges of the pan and add the shallots, crushed red pepper and the remainder sliced garlic. Add a little more olive oil if the pan seems too dry and cook the new additions for about a minute before tossing with the sprouts. Continue to sauté for a few more minutes until the sprout leaves start to turn brown. Add salt and pepper to taste, as well as the juice of about half a lemon. By this time, the pasta should be done. Drain and toss with the sprouts. The pasta may seem too dry at this point so feel free to add a splash or two of chicken or vegetable stock for more moisture. Add most of the toasted bread crumbs and toss well. Transfer to a serving dish and top with Parmigiano-Reggiano and the remaining toasted bread crumbs. One last drizzle of olive oil wouldn’t hurt either. Enjoy! Well I say brussel sprouts have never looked so beautiful! That photo of them in a bowl? Totally gorgeous. The colours are spot on. I know exactly what I’m going to be doing with my leftover Christmas brussel sprouts, now! Jean – “great minds think alike” – we were both on a brussels sprouts kick. 🙂 Your pasta dish looks and sounds incredible. The touch of green just adds to the dish. Actually I could eat them almost everyday and the chef at the party told me about another preparation that I am going to try plus the new Botegga cookbook has a great brussels salad in there. Hope you have a great day!!! What a wonderful dish! I love brussels sprouts, i might even say that it’s my favorite vegetable. I think it’s a great idea to separate out the leaves to include it in pasta, otherwise i think the brussels sprouts would be a little dis-proportionate. I really want to try this… My husband doesn’t like brussels sprouts but i think since they are a little watered down (meaning he wouldn’t be taking huge bites of dense sprouts) in this dish, maybe he would like it. How do you like that cookbook? I love vegetables but i’ve found that cookbooks for different cuisines (Korean, greek etc) rather than more comprehensive ones work best for me because I cook based off of what style of food i’m on the mood for. Roxan, I like the way the book is organized. I spent some time looking through it one night, hoping to be inspired to make a new (to me) vegetarian dish and this was the product of that read. I recommend it. I made brussels sprouts w/ breadcrumbs for my husband and he didn’t care for them at all, but I LOVED them. I am going to keep cooking them for him until he likes them, hehe. I’m happy to see some posts with creative ways to prepare Brussels sprouts – they’re so misunderstood 😉 I’m trying your pasta dish real soon (and Lisa’s Bruschetta) YUM. I had seen this dish before and planned to try it and then I forgot all about it! 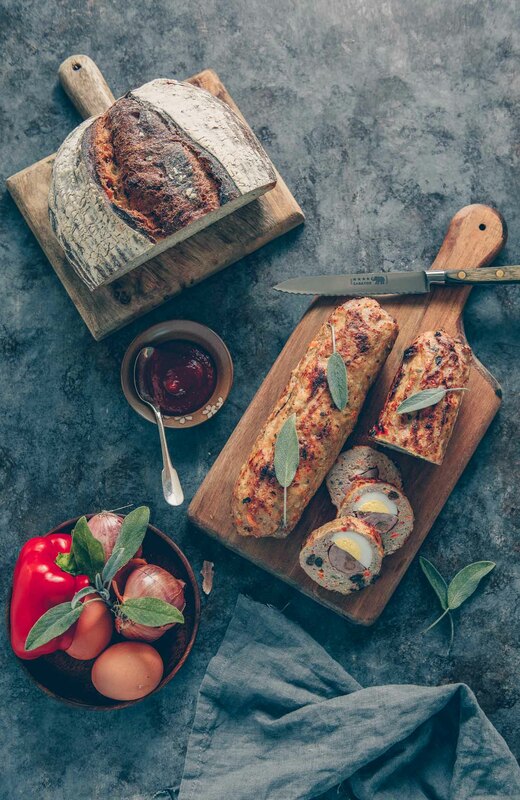 Love it though and your version looks beautiful and mouthwatering! I love pasta and I love brussels sprouts. This sounds like an interesting, but lovely, combo. I’ll have to give it a shot. I love brussels sprouts — I’m actually growing some in my garden right now and am keeping my fingers crossed for a harvest soon…(thus far I see no buds) :(! 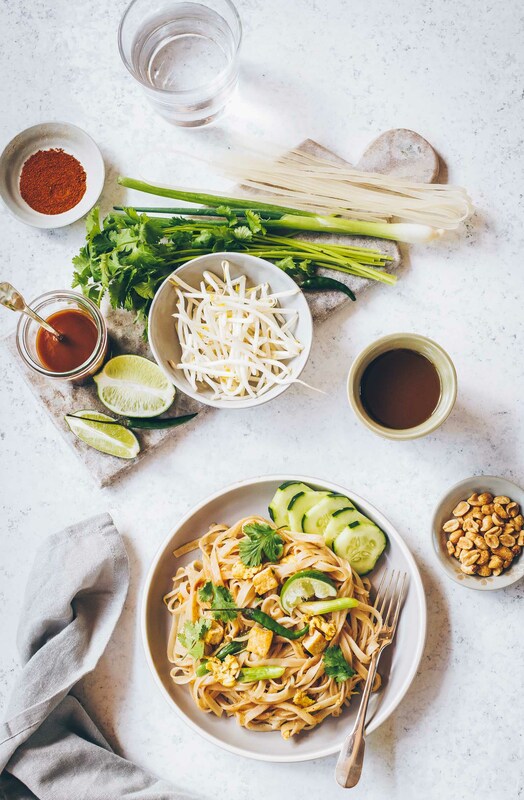 This recipe looks delicious and savory, I may just skip the wait and buy some this week, you’ve inspired me! Joy, I will keep my fingers crossed for your brussels sprouts harvest, too. They’re so much better freshly picked. This dish does works well for the store-bought once, though. Thanks! Yum! I should try shredding sprouts more often, like what you did here. Maybe then my family would be more willing to eat them. I love orecchiette pasta and with the fresh bread crumbs, delicious! Wow! This looks delicious. I adore Brussels sprouts and I’m very intrigued by the idea of separating the leaves. Ryan and I want to try this recipe soon…and I think the anchovies are an excellent idea. Thank you so much for sharing. I hope you have a lovely Friday! My mouth is watering!! What a great looking dish! This reminds me of an orecchietti recipe I haven’t made in almost 10 years but without the sprouts since I don’t like them. 🙂 Do you think that separating the petals will help someone like me actually become a converted brussel sprout lover? Recently, I keep seeing them at the different supermarkets where I shop, but I just-a-keep-on-a-walkin’. 🙂 I really need to try the bread crumbs… it makes the dish look very comforting! Hi Jean, this looks wonderful, I have the Chez Panisse vegetable cookbook and like all of the Chez Panisse cookbooks it is full of good recipes. I haven’t made anything with brussels sprouts this season but your dish is kind of talking to me:) Have a nice weekend, stay warm! Gee, something I would never have thought of but it makes perfect sense. Brilliant! What a fantastic recipe. I have never pulled apart brussel sprouts before and love the garlic. Hi! I have an award for you! To me you fully emody the spirit of this award. Congratulations! Please come by my blog to learn more and ‘pick it up’.